This is Mabelle, Language Services Manager of Maria Lenk Aquatic Centre – Rio 2016. 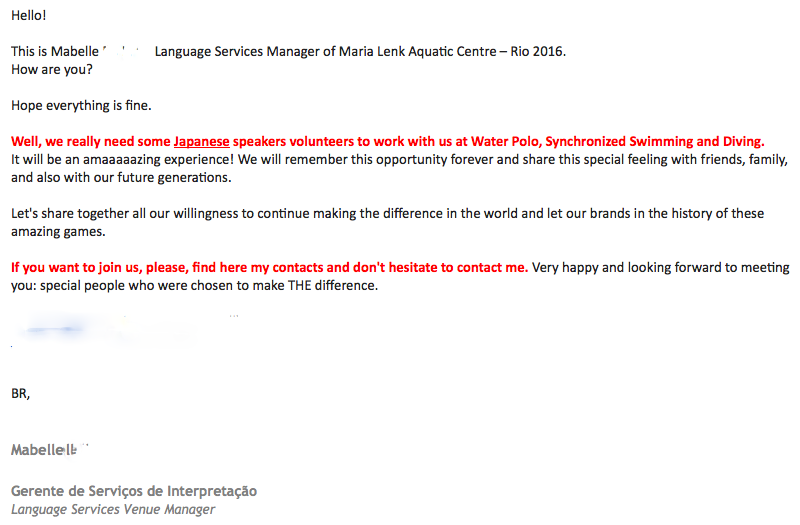 Well, we really need some Japanese speakers volunteers to work with us at Water Polo, Synchronized Swimming and Diving. It will be an amaaaaazing experience! We will remember this opportunity forever and share this special feeling with friends, family, and also with our future generations. Let's share together all our willingness to continue making the difference in the world and let our brands in the history of these amazing games. If you want to join us, please, find here my contacts and don't hesitate to contact me. Very happy and looking forward to meeting you: special people who were chosen to make THE difference.